Last night's episode of 'Mad Men' spent one half of the episode in California and the other half following the two office divorcees (Don Draper and his British partner Lane Pryce) on a raunchy boy's night out in the Village. Pryce had been victim earlier in the episode of a disastrously slapstick mix-up: his secretary accidentally switched the notes in two boxes of roses, sending a heartfelt card intended to his ex-wife instead to office manager Joan, and vice versa. Joan responds by storming his office, tossing the flowers in his face, then firing Pryce's befuddled secretary. Wacky! At least the newly unemployed woman had the good sense to order the flowers from Rhinelander Florists, one of the poshest places to get your bouquets on Madison Avenue in the 1960s. Rhinelander (867 Madison Avenue) was opened in 1936 by Frank Tomaino, a former gardener for Huntington Hartford, the old-money retail magnate who owned the A&P supermarket chain, and perhaps it was through these connections that Tomaino was able to accumulate a client list that included "the Rockefellers, Astors and Whitneys" (according to his obit). Just as likely however it was the desirability of Tomaino's choice location and that which he chose to name his business -- the mysterious Rhinelander Mansion at 72nd Street. The lushious manor, dripping with old world Beaux-Arts elegance, is notable in that its eccentric owner, Gertrude Rhinelander Waldo*, never bothered to move in when it was completed in 1898. Mrs Waldo, heavily in debt, didn't seem to have a knack for real estate. According to historian John Tauranac: "In 1908, a 'For Sale' sign hung in front of the building, but there was no sale, as much because of Mrs. Waldo's price tag as her impetuosity. One broker had practically consummated a sale, but while the papers were being drawn up Mrs. Waldo calmly said, 'I don't think I'll sell,' and walked out." The mansion was left unoccupied -- and quite unkempt, to the consternation of neighbors -- until 1911, when Gertrude passed it on to her sister, who didn't want to live here either. The first floor was made into retail spaces in 1921, and it was fifteen years later, I believe, when Tamaino moved in. His business faced Madison Avenue and would go on to share the building with a corner pharmacy. By the 1950s, the upper floors were finally occupied, and how -- by the photographer Edgar de Evia, known for his work in ad campaigns for products like Borden Ice Cream, and for fashion spreads taken here in his very own rustic home, famously transformed into a hazy, Miss Havisham-style set piece. Rhinelander Florist was well associated with the floral needs of upscale Upper East Side clients. In 'The Two Mrs. Grenvilles" by Dominic Dunne, he writes, "Babette told her to look up the Grenvilles in the Social Register at Rhinelander Florist on the corner of Madison Avenue and 72nd Street." By the 1980s, the florist pops up at a Sixth Avenue location. 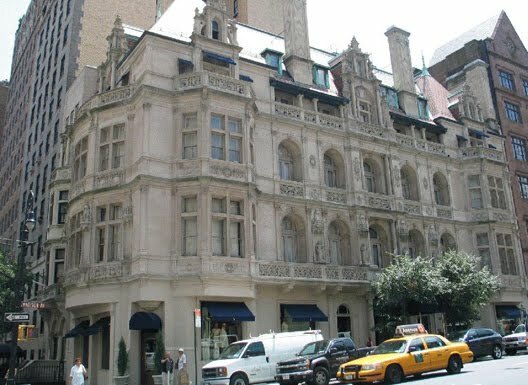 Tomaino died in 1988, and by then, the Rhinelander Mansion was in the throes of a massive renovation, courtesy Ralph Lauren, who turned the dusty old relic into the retailer's flagship store in 1986. ALSO: Don and Lane fill up their flasks and hit a movie theater for some loud, obnoxious heckling. I'm not a big Godzilla fan, but based on chronology, the film they were watching had to be 'Godzilla vs. the Thing', more popularly known as 'Mothra vs. Godzilla' -- unless they were at a revival house watching the original 1954 'Godzilla'.